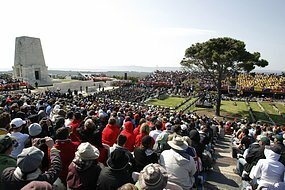 Watching the Anzac Day marches on television today, it reminded me of the marches I saw 20 years ago when I first arrived in Australia. In 1989 the last few First World War diggers led the parade. They were dying out then and now they are all gone. In today’s march it was the turn of increasingly rare Second World War vets to feel the cold of comrades dying in numbers similar to when first they met. Anzac Day is about ritual, the reason the media loves covering it in detail. The day is a stable source of controllable news and clichés about pride, mateship and honour. One important ritual is the day off work which was skewed today as it fell on a Saturday. Numbers were down on last year as people didn’t feel the same sort of time sacrifice was required on the weekend, and most states did not give out a holiday on Monday. A newer tradition is the battleground service where Australians and Kiwi backpackers combine a European holiday with a Turkish remembrance theme. Numbers were down at Gallipoli due to the recession, said the ABC but Lone Pine still attracted 7500 people. Another 3000 packed out the French 1918 battle site at Villers-Bretonneux which rose to Australian prominence last year on its 90th anniversary. Though overseas Anzac Day celebrations date to 1916, it was one of the few things well-drilled founders of the tradition probably hadn’t anticipated. On April 25 1916 Australian and New Zealand troops commemorated the Gallipoli landing in England, Egypt and the Middle East and in France (where they had just arrived). It captured public imagination in 1916 thanks to the war reporting of Ellis Ashmead-Bartlett and Charles Bean. Throughout 1915 their lively accounts ignited a fire which religious institutions were quick to pick up on. By June bodies were coming back from Turkey in significant numbers and it continued until the operation was called off in December. A national day of mourning was needed to deal with collective grief. The first Anzac Day Commemoration Committee was set up in January 1916. Brisbane auctioneer Thomas Augustine Ryan decided there should be a commemoration on 25 April. He was in the local recruiting committee and the father of a soldier who survived Gallipoli. Ryan suggested the idea to TJ Ryan (no relation) Labor Premier of Queensland. Premier Ryan convened a meeting on 10 January 1916 and high profile Anglican priest Canon Garland drew up an agenda. David John Garland was a remarkable political operator and the perfect man for the Anzac job. He was a missionary and organiser with a reputation for getting things done. Born in Dublin he emigrated to Queensland in 1886 aged 18 to follow a career in law. But he met a Toowoomba Anglo-Catholic rector who employed him while he prepared for ordination. Garland was a chaplain in the army prior to the Boer War and spent ten years in Western Australia where he got the rules changed to allow religious education in state schools. He returned to Queensland where he did the same and won a referendum to allow bibles in state schools. Garland got an Anzac memorial on the 10 January meeting agenda. A motion was passed to “make arrangements for, and carry out the celebrations of Anzac Day”. The Brisbane Courier reported Garland saying the war was teaching people “their duty to God in a degree would compensate for their neglect of God in the past” and defeat in Turkey was no disgrace. The first troops ashore at Anzac were the Queensland 9th Battalion of the 3rd Australian Infantry Brigade. The Ninth were also the first to return home in coffins in large numbers. As 1915 progressed a culture of commemoration grew in Brisbane. Garland also arranged for marchers to get free public transport from Queensland Rail. His genius was overcoming Catholic suspicions about Protestant commemorations. Garland made sure the ADCC council was ecumenical and top-heavy with influential people. He used his Irishness to win over a suspicious Roman Catholic hierarchy. Military sacrifice did not compromise religious belief, so all religions wanted a part of it. Together, they would ensure Anzac Day always had a religious as well as secular charter. Garland included a two minutes silence which allowed everyone to pray to their own God. There was also speeches, hymns, the Last Post and God Save the Queen. It was followed by a march of returned servicemen. The ADCC wanted the day to have similar solemnity to Good Friday (which in 1916 was just four days before Anzac Day). No cinemas, racecourse, hotels or sporting venues could open. Royal support helped the ADCC. King George V attended the 1916 Anzac Day two minutes silence at Westminster Abbey. There he issued a rare message direct to Australians: “Today I am joining them in their solemn tribute to the memory of their heroes who died in Gallipoli. They gave their lives for a supreme cause in gallant comradeship”. But even with royal imprimatur, it took 14 years for Anzac Day to spread across Australia. Garland worked tirelessly to ensure the day kept its religious dimension. From 1921 he lobbied the Prime Minister to declare a uniform celebration across the Commonwealth. New Zealand declared a day of solemn remembrance in 1920, Queensland followed a year later and WA in 1923. Businesses and hotels were required to close until 12.30pm to allow for services and the march and it would take another seven years for Queensland to shut down everything for the entire day. The federal government took over Anzac Day from Garland’s ADCC and it laid the Inauguration Stone at the National War Memorial in 1929. 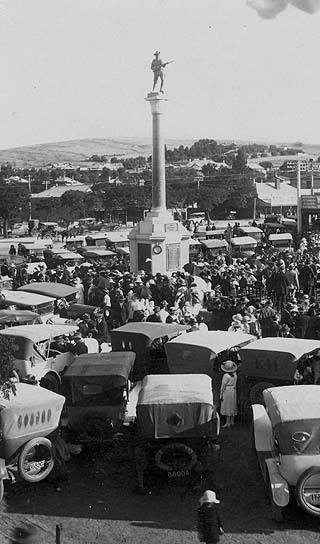 At the June 1929 Premier’s Conference, Prime Minister Stanley Bruce invited all church denominations to hold memorial services the following year and asked the Returned Sailors and Soldiers Imperial League of Australia to arrange meetings of remembrance. The RSSILA could not decide if it wanted the tone of the meetings to be solemn or jubilant. It decided on both: solemnity in the morning and fun in the afternoon allowing the opening of sporting venues and bars. Most states went with the RSSILA (now RSL) model. Queensland went alone with the “sacred day” approach. In 1964 the Anzac Day Act was modified to allow hotels, racecourses and places of amusement to open. Australia finally had a nationally sanctified and consistent Anzac Day appealing to the spiritual and the worldly sides of the nation’s psyche.